There’s a lot that can be said about these two. I often say how grateful we are to have this career where we get to witness some of the happiest people on their best day. It truly is a privilege that we’re thankful for every day. Caitlin and Bharathi’s incredible relationship is a testament to what we do. We hit it off months before their wedding day when we met for their engagement session. Well, it technically wasn’t our first time meeting, as they were part of Bharathi’s best friend’s wedding the year before, but it was definitely awesome to have the chance to converse with them one on one and really get to know these two. They told us of all their wedding plans, and we were blown away to see them all come together over a multi day celebration. They had 2 separate ceremonies, one smaller and more intimate than the other. We arrived on the Saturday of the large celebration to Home 2 Suites in Lafayette, LA where Caitlin and Bharathi got ready just down the hall from each other. 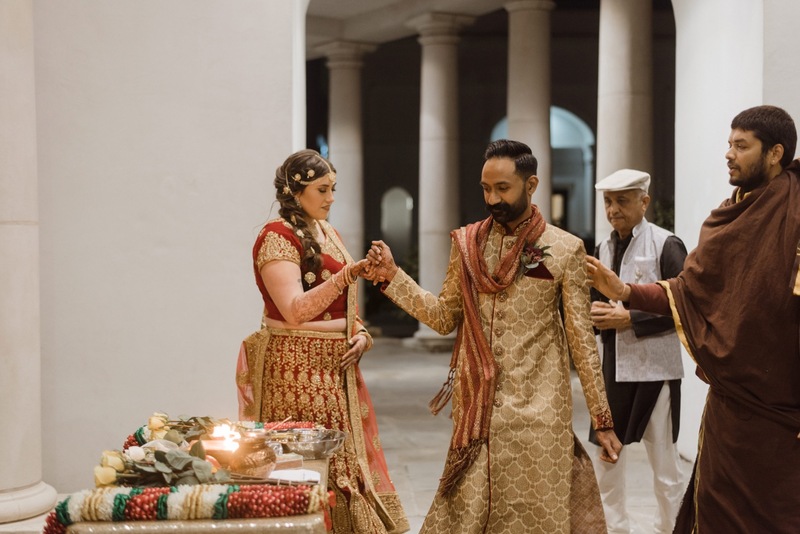 Caitlin was surrounded by her beautiful bridesmaids and Bharathi had drinks with his groomsmen before playing a hand of cards after he had gotten dressed. Both Caitlin and Bharathi looked incredible for their big day. We ventured out to the ceremony spot by the large pillars next to Le Pavillion, where guests sat under the string lights above after the sun had set. Every element of the ceremony was taken into consideration, and it showed. After Caitlin and Bharathi made it official, we stayed behind for some poraits of the two of them before running over to the reception in Le Pavillion where they danced the night away. It was a wedding we won’t forget. Thank you both for having our team there and congratulations once again!